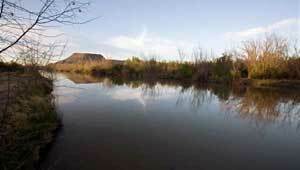 The Rio Grande is the lifeblood of New Mexico’s people, farms, forests, and wildlife. Winding through the heart of the state, the river supports New Mexico’s greatest biological diversity, quenches the thirst of much of the human population, waters most farms, and lures countless visitors from urban centers. But with population growth, development and environmental change, this mighty river, its watersheds and natural beauty are threatened. The Trust for Public Land is working to preserve vital stretches of the river to safeguard fragile watershed, protect drinking water supplies, and revitalize river habitat for public enjoyment. Recent accomplishments include the Taos Valley Overlook, which provides safe public access to the spectacular basalt Río Grande Gorge near Taos, and Ute Mountain, which protects a stunning 14,344-acre landscape on the New Mexico–Colorado border, creating new recreation opportunities along seven miles of the Río Grande.